↑ "French Train Hits 357 mph Breaking World Speed Record". foxnews.com. 4 April 2007. สืบค้นเมื่อ 11 February 2010. ↑ , "World Speed Survey: New lines boost rail's high speed performance". Railway Gazette International. 4 September 2007. สืบค้นเมื่อ 1 May 2009. ↑ "World Speed Survey 2013: China sprints out in front". Railway Gazette International. สืบค้นเมื่อ 2 July 2013. ↑ David Gow (9 July 2008). "Europe's rail renaissance on track". guardian.co.uk. London. สืบค้นเมื่อ 9 February 2010. ↑ Ben Fried (15 July 2008). 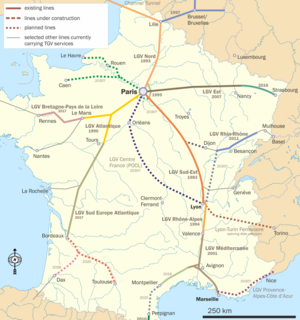 "French Trains Turn $1.75B Profit, Leave American Rail in the Dust". Streetsblog New York City. streetsblog.org. สืบค้นเมื่อ 9 February 2010. หน้านี้แก้ไขล่าสุดเมื่อวันที่ 2 มิถุนายน 2561 เวลา 01:22 น.